The cover will draw you into the book of a new series. Both animals in the cover, Charlie, a mix breed dog and Alvin, a goat are secondary characters in the book. The characters are well developed and the descriptions of the area will place you there. Norie Ellington, a screenwriter has agreed to take over the family vineyard in Penn San, New York for a year. Upon arrival, Norie meets Elsbeth Waters an owner of a local B&B who complains repeatedly about the vineyards noise. Later Elsbeth’s body is found on the family’s property and Norie decided to investigate in order that mystery is solved. After many twists and turns, Norie finds the answer but not before foolishly putting herself in danger. I recommend this book. Disclosure: Many thanks to Kensington Book s for my copy for review. The opinions expressed are my own. 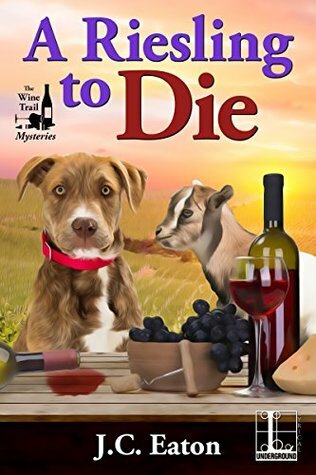 This entry was posted in #NetGalley, Books, Uncategorized and tagged Animals, B&B, cozy mystery, Dog, Norie, Vineyard. Bookmark the permalink. I have this one to read yet.